The following lists represents only a small portion of the free eBook libraries available today. Each of the libraries listed provides free services to the public. 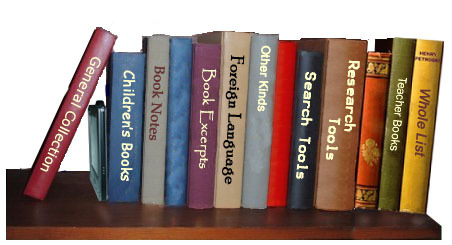 Depending on the library book can be presented in either single or multiple formats. Site contains a catalog with roughly 2,000 links of e-texts, located on various servers. The novels available by email request. Over 90 relatively new popular science fiction books in Reader, Palm, Rocket, and RTF. Eight Dr. Who books in multiple formats. Seven authors of famous classic horror including Poe and Lovecraft (HTML). over 200 html formatted classics. Collection of digital literary texts (mostly U.S. authors) in chapter HTML. A collection of over 1600 children's literature titles from the US and UK presented by the State University Libraries of Florida. EBooks in PalmDOC (mostly) and MS Reader formats. Links to carefully-chosen selections in the following categories: Outstanding Books for the College Bound; Best Novels Written in the English Language; Downloads Available by Author; Great Books For Teens; Political Documents. More than forty free e- books (mostly popular classics) in Microsoft Reader (.lit format). The site has on-page translation available in six European languages. Over 70 adapted books in a variety of formats including Boardmaker, PowerPoint, and PDF. 38 fables in traditional and modern forms. Most in html some in flash. Children's stories which can be read on the screen or have read aloud. Has two books in flash format. Links to a variety of online children's books. BAB Books: http://www.sundhagen.com/babbooks/ Over 12 online html picture book. Digitized versions of children's books published in Great Britain and the United States from the early 1700s through the current year (scanned images). Selected stories from their site are available free as PDF single sheets and as MP3 files. 191 stories read by members of the screen actors guild (and others). Stories are read and displayed through streaming video. Additional story resources are also available including stories by phone and guest story readers for schools. 12 html picture books with the option to have the book read aloud. Children’s classic books in HTML format. Children's and chapter books in a variety of formats. An online bookstore for teachers and schools, this company does offer a 30 day trial program to allow teachers to download and use eBooks for use with their classes (lit). Over 30 illustrated children's stories in html. Seventeen young children's stories HTML based. Four interactive stories about Clifford the Big Red Dog in flash format, presented by Scholastic. Leveled books in pdf ebook, print, and editable formats. 14 reader's theater scripts (html). Three early elementary Hazardous Weather Readers and Teacher Planning Guides (PDF). 14 leveled reading booklets (K-6) in a special web format, also has associated teacher information. The ICDL is building an international collection that reflects both the diversity and quality of children's literature from 27 cultures in 23 languages (html). This section of IPL contains The Reading Zone which is similar to the fiction section at a public library. There are links to on-line stories and information and links about favorite books and authors. New record each weekl of a “classic” record audio book from the 40’s and 50’s into MP3 format. KidPub is an online database collection of over 40,000 stories written by children for children. Storybook site for toddler age children (HTML & FLASH). Over 50 children's books ages 2-preteen in html. Books will read aloud. An online stories Echo the Bat and Amelia the Pigeon in html. Over 150 short stories in flash format with audio. A collection of free scripts for readers theater, adapted from stories by Aaron Shepard and others. Links to over 50 scripts. An online book seller of leveled book that you print out. Sample books are available (pdf). A collection of read aloud books that changes monthly (Flash format). Eight online big books (html). Video stories from the three selected winners. Over 45 scripts in .doc and .pdf formats. 19 stories read by members of the screen actors guild, including modern classics such as Stellaluna and the Polar Express. Stories are read and displayed through streaming video. 6 stories for elementary children along with suggested readings and print out activities. 15 Stories and associated books and activities for children and parents. Folk and fairy tales from around the world in HTML. Three books (HTML) for 1st Grade readers. Has two online picture books (html). Search database of thousands of books. Search from over 20,000 listings. Fledgling ( http://www.korval.com/fledgling/) - a novel from the Liaden Universe® by Sharon Lee and Steve Miller. Electric Library http://www.elibrary.com has full-text documents and images concerning: magazines, maps, books and reports, newspapers and newswires, radio, TV and government transcripts, and pictures. ElectricLibrary's Encyclopedia.com http://www.encyclopedia.com more than 14,000 free articles from The Concise Columbia Electronic Encyclopedia (3rd ed.). An abridged online version of Encarta Encyclopedia. Search the article titles or the full text. Encyclopedia Smithsonian http://www.si.edu/resource/faq A resource for teachers and students with thousands of sources on hundreds of topics. Provides direct links to over 7000 scholarly periodicals which allow some or all of their online content to be viewed by anyone for free (though some may require free registration). Information Please http://www.infoplease.com Offers online almanacs, encyclopedias, and dictionaries (links under “Sources”). The Internet Public Library http://www.ipl.org a resource for a variety of collections. Library Spot http://www.libraryspot.com A free virtual library resource center for educators and students, librarians and their patrons, families, businesses and just about anyone exploring the Web for valuable research information. The U.S. Library of Congress http://www.loc.gov Web site is the Internet location of the largest library in the world. Comprised of approximately 115 million items in virtually all formats, languages, and subjects. Book search tool that searches the catalogs of libraries near you to find the books that you want to check out and read.